1. Does Timekeepr work on tablet and mobile? Android and iOs? Yes, Timekeepr works for both Android and iOs, either on mobile or tablet. 2. Can my employees use their phone to clock in/log into jobs? Yes, whenever an employee is added to Timekeepr they will receive an invite to the system. If you have enabled that employee to have access to the mobile app, then they will be able to clock in from mobile. 3. Can I use one tablet for all my employees? Yes, if you log in with administrator credentials a keypad will be shown. Each employee can enter their 4 digit pin and then clock in/log into jobs from this tablet. 4. How many devices can I use with Timekeepr? Timekeepr will allow you to use as many tablets as you want. You can have 1, 2 or 20. 5. Does Timekeepr record my location on clock in? Yes, Timekeepr requires location for clocking into and out of work. As well as logging into and out of jobs. 6. How many employees can I use Timekeepr with? Our current maximum number of employees for each company is 9999. 7. Can I use Timekeepr across many office branches? Yes, we can work with any number of office branches. 8. Is there a limit to the number of jobs I can use Timekeepr with? No, you can have unlimited jobs. 9. Is there a free trial? Yes, we offer a free 14 day trial that is cancellable at any time. 10. Is there any penalties for cancelling a subscription? No, your subscription will be cancelled at the end of that current billing period e.g. the end of month and no extra charges will be required. 11. Does Timekeepr own my employee data? No, we are a data service provider and do not lay claim to any of your employee data. The company is the data controller and is responsible for their employee data. Yes, we employ modern best practices for security. Passwords are salted and hashed using a modern hashing algorithm. We use SSL for all communication between the app and our API. 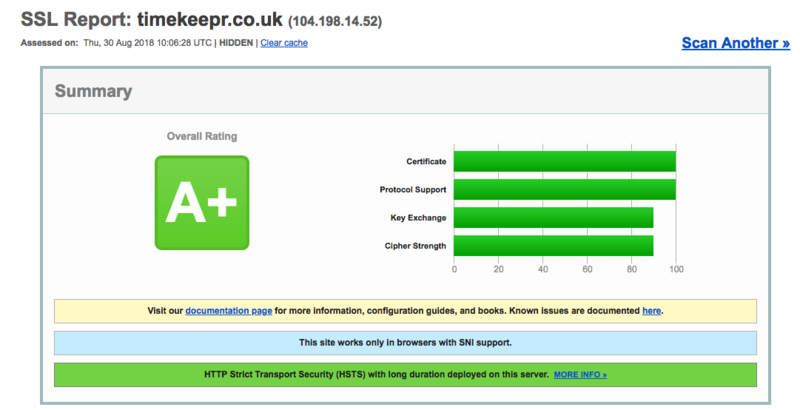 We have an A+ score from SSL Labs. All your data is stored securely under your company account in Timekeepr. Only your staff will be able to access your relevant data. 13. Does Timekeepr work across multiple timezones? Yes, we detect the timezone in the device being used so it will work internationally. The reports in the web portal currently are set to a single timezone. 14. Does Timekeepr support multiple languages? Not yet, we currently only support English. 15. Does the employer have to inform their employees about data used in Timekeepr? The processing of HR data is in the legitimate interest of the employer and required to fulfill a contractual obligation. In order to ensure that the rights of employees are not unfairly compromised, there must be full and transparent disclosure of what data processing is taking place and for what purposes. We would recommend to our customers to make it clear to their employee what data is captured, where it is being stored (you may used something other than Timekeepr to store employee data) and ensure that data captured is for a legitimate business reason. When invited to the platform, users have to consent to using Timekeepr prior to signing up. 16. What data does Timekeepr capture on each employee? Timekeepr captures an image of the employee on clock in as well as capturing the time and device location on clock in and logging into a job. Additionally, background location can be used to track the real time location of on-site workers and their movements. This has to explicitly consented from the employee on their device. 17. Is their any privacy concerns with regards to tracking employee location data? 18. Does Timekeepr use any of my company data for alternative purposes outside of the service? No, we don't use your company data for anything else other than providing reports and service to you. So we won't aggregate it or put it into a collection for analysis or anything like that. 19. Is Timekeepr infrastructure scalable? Yes, we are built on top of modern platform services including Heroku and AWS. So we have the neccessary resources to scale to the size of your business. 20. Does Timekeepr keep an up to date in-building list? Yes, we do. You can see in real time who is in and out across all your office branches and sites.